I had started the 28th year of my life with a 14 mile run on the treadmill. That was a little grueling. Missing 8 days of running with a twisted ankle ended up being a blessing in disguise. It gave all my injuries more time to heal completely. I tried running on Tuesday and Thursday but my ankle was just not ready. On Friday, after procrastinating for over 5 years, I got a couple of my wisdom teeth removed. I can't remember experiencing anything like it ever ... After the IV for the general anesthesia I have no recollection of what happened for the next few hours. I've never been really drunk so I've always been in total control of my senses. I spent the rest of the day sleeping and wearing off the effect of the drugs. I scrapped any plans of going to the San Juan islands for the weekend. My Pfitz 18/70 schedule starts next week. I hope I've gotten through the worst of my injury issues for a bit... I'm shooting for 60 miles this week. Apart from running this long weekend, I've been eating a lot of ice cream (more than I can remember having for a long time) and sleeping :) You don't get wisdom teeth removed everyday so I've got to enjoy my guilt free ice-cream! I started all my runs (6,6,10,6,X) this week at 8pm and still finished in daylight as the sun set! After June 21st, the days will again start getting shorter so I've got to appreciate the extended light while it lasts. I had high hopes for the weekend. I had intended to get in 22 miles in total to hit 50 for the week. Today was a beautiful day for running. I was just getting into my stride but suddenly after I had run about 1.5 miles I twisted my ankle on the grass! It was such a jolt of pain, I knew I had to have done some damage... Thinking about it what was funny was that before I lay on the grass I remembered to pause my Garmin. It was really nice of a biker to stop and ask me if I was OK & if I needed to call someone for help. I tried to run after a bit but I had to stop after half a mile. I knew I would not make it far and I would have to run back too... I stopped and slowly began to walk back home. 2.5 miles takes a long time to cover especially while walking on a twisted ankle! So instead of running 14-16 miles I ran 2 and walked 3. I've been running on the grassy trail all year but the grass has grown quite a bit in the last month making the surface uneven. I will have to start running on asphalt again. I'm icing my ankle as I write. Hopefully, I'll be able to get in a run tomorrow. However, I don't intend to have to walk back again ... I might go for a swim instead. Swimming is always a humbling experience for me. I find myself panting after 3-4 laps at a slow pace while on the fast lane there are folks breezing by without breaking a sweat. Words of wisedom from a 4 time St. George marathon finisher. She ran a sub-3 as a masters runner in her last run there. "Do your uphill and downhill training. There is a nasty hill in Veyo, but what people forget about is it continues in a flatter form until mile 15, then its quad punishing downhill ... then another thing people forget about is the hill at mile 19. I recommend doing hill repeats as well as strength runs where you run a steady uphill course (as long as you can find) and then work on pushing the downhill with good form. I am not joking, if you are not prepared, the last 6 miles will leave you hobbling." St George it is !!! Made it through the St George lottery !!! Goal for the week: Run 5 miles every day and hit the gym for weights. I'm still trying to get my pre-marathon injuries healed. Right not it's a trade-off between running enough to help my injuries heal vs running too much and regressing. The folks at my PT place seemed more happy than me about my marathon finish. For me it was more of a case of "been there done that". My PT told me that he was really proud of me. He was telling everyone out there that I ran a marathon. He had been treating me for 5 weeks before the marathon so I guess this was a goal accomplished for him as well. My week was more or less dominated by someone rear-ending my car in the grocery store parking lot and taking off (I did not see it happen). It hurts because it's just a 3 month old car. 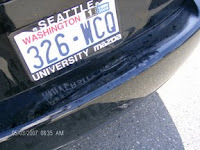 It'll take $2400 in repairs to replace the trunk & bumper along with painting everything to match. Thanks to the WA state additional protection I'll just have to pay $300 in deductible to GEICO and I have a rental car for a week till I get my car back. It just makes me wonder how the guy who did this can live with himself. It had to take a really sloppy SUV driver to do what he did so I'm sure he'll end up with something worse soon and end up paying for it! On Saturday morning Jon called me to check how I was doing after the marathon. He was going out for an 8 miler in 80F and 75% humidity in Dallas. It was cloudy and in the 50Fs here. I had to go out! I could feel both my VMO and my ITB and I just felt tired! My HR was elevated (it normally takes 3 weeks post-thon to get back to normal). I stopped 4 times during the 5 miler. I probably would have walked it in but running is so much faster. Today's 5 miler was better. My ITB did not bother me and my VMO felt better. I didn't have to stop and actually enjoyed my run. My HR was still elevated. It was at MP effort for 9 min miles.